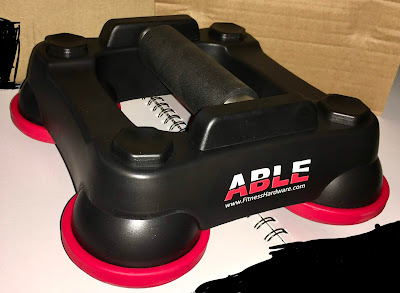 ABLE (Advanced Bodyweight Leverage Equipment) is the talk of the fitness industry when it comes to a new product for a new you. Why? ABLE is designed to allow users to benefit from hundreds of workout move variations by just using their body-weight. Due to the fact ABLE is designed to glide and roll smoothly in any direction; the workouts are low impact, but offer incredible results for instability, bodyweight training, burning calories and creating lean muscle mass. ABLE offers workout moves that are scalable for anyone. Beginners can start with easy moves, while intermediate and advanced users have unlimited numbers of upper body, lower body, ab and core moves, for a progressively difficult challenge. ABLE is simple and portable, and can be used almost anywhere. This new product is simply great for bringing to the gym, or working out at home. ABLE is quickly becoming an indispensable piece of equipment for personal trainers nationwide. ABLE works with smooth rolling movements on soft surfaces such as carpet, gym floors, track and challenges instability on hard surfaces, including wood and concrete. In summary, this product offers hundreds of challenging moves and sequences, while resulting in an intense workout for beginners and athletes alike.